Bringing you the latest in our series of features from the runways of New York’s Bridal Fashion week, today we take a look at couture designer Della Giovanna’s 2015 Collection, inspired by the intricate art of medieval armor! The 2015 Collection combines the romance of traditional wedding gowns and European sophistication with elements of medieval chainmail armor. 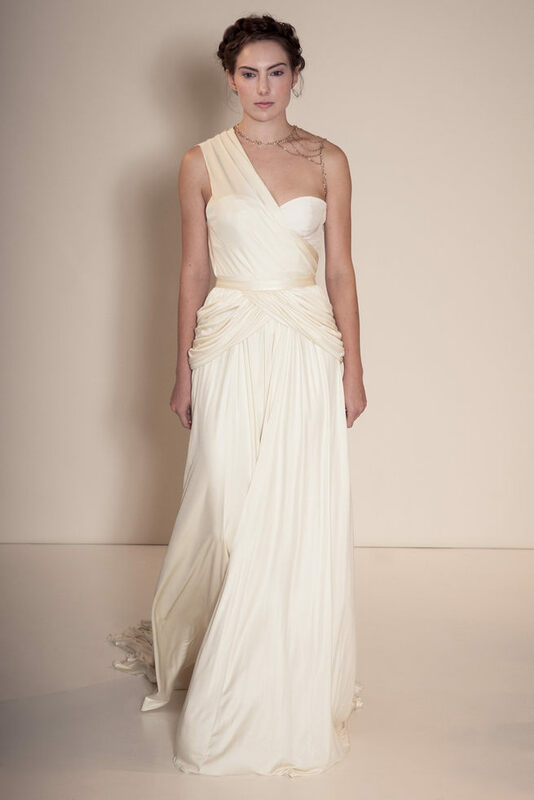 Della Giovanna is known for its edgy aesthetic that caters to the fashion-forward, contemporary bride. The newest collection reflects the growth of the designer’s alternative vision through structured gowns, tops and skirts made with pure silk and layered with elements of genuine white leather and gold chainmail. Della Giovanna’s 2015 Collection includes a range of silhouettes from the flattering fit-and-flare to sleek mermaid to knee-length pencil skirts as well as corseted tops offering a variety of necklines. The tops and skirts can be mixed and matched, giving each bride a chance to create unique customized looks both for the ceremony and the reception. Della Giovanna bridal design combines the glamour of a traditional wedding gown with the fashion-forward trends of today’s ready-to-wear and popular culture. We caught up with Michelle Della Giovanna, founder and Creative Director behind Della Giovanna. After graduating from the Fashion Institute of Technology and working for several fashion brands, including Malan Breton, Michelle Della Giovanna saw an opportunity in the bridal industry to create elegant, yet alternative designs for brides with a contemporary sense of style. And so Della Giovanna was born. When I was little, my mom taught me how to sew so that I could make outfits for my American Girl Doll. I never even realized it was a career option until high school. But once I discovered I could actually go to school for fashion, it all just fit together! I haven’t looked back since. Michelle is not afraid to push boundaries with her designs and wanted to see how the industry people would relate to edgy bridal design. We debuted the label in Fall 2013 with a collection of edgy separates that featured rarely used elements like hardware and leather. I included some studded details and small edgy elements. After receiving support from the industry, I really felt I could take it much further. The first look that walked the runway this year was a full chainmail headpiece, which was really fun, crazy, and exciting. I couldn’t wait to see people’s reactions. I wanted to make people’s jaws drop, and I did. Edgy, modern and statement-making. I like all of our dresses to be wearable, but still have an edgy feature for non-traditional brides. I love the unexpected and I think our gowns show that off. The current collection was inspired by chainmail. I got to play with some chainmail while on a trip to Germany, and I fell in love with the intertwining links. I wanted to see if I could make something so shapeless and masculine into something pretty, feminine, and flattering. The hardest part of the design process is always finding inspiration. You never know when or where inspiration will hit. Once an idea infiltrates my mind, it’s really all I can think about. When I’m in my design phase, I carry a notebook with me everywhere. I even leave one on my nightstand! As soon as an idea hits me I immediately sketch it so I won’t forget. After I’ve compiled a ton of sketches, I lay them all next to each other in our Brooklyn studio and decide which ones make the collection. Once the designs go into production, they get tweeked a little here and there to make sure they are perfect. I think bridal separates is a huge trend. 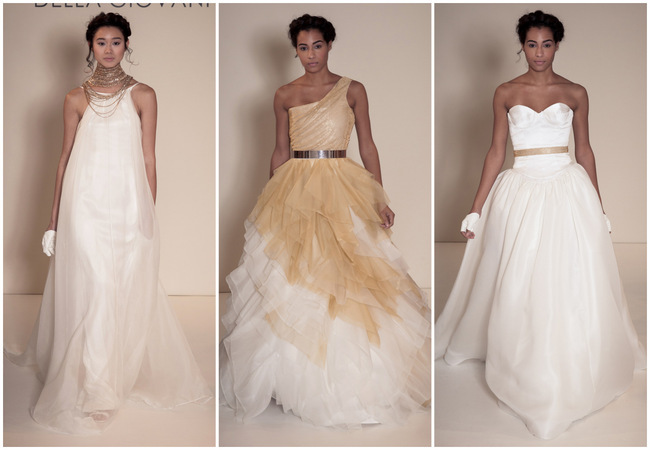 Last year, we were the only designer to do a full line of bridal separates. This year, we are still the only designer to do a complete line of separates, but many major designers included separates in this year’s collections that haven’t in the past. We also saw a lot of sheer overlays. One of my favorite looks from our collection is the Alexandria dress, which is a fitted silk gown with an organza trapeze overlay. A lot of designers played with the idea of having a fitted silhouette underneath and a loose sheer layer on top. This ethereal look was really big on the runways. Remember that shopping for the dress is supposed to be fun. So many brides get stressed out over finding their dress. Get the two most supportive people in your life to go with you, because bringing too many people can be too overwhelming. Enjoy some champagne and try on a hideous dress for a good laugh. Always be open minded when you start trying on gowns. Try different silhouettes and styles. You never know what dress you might fall in love with, but when you try it on you will know it’s the one.